Technological innovation has influenced the design of the places in which we live and work in multiple ways. This symposium explores how technology can foster a healthy living environment in tall buildings, within both office and residential spaces. Join USC Architecture Dean Milton F. Curry in a welcome reception for USC Alumni in China. We will also be welcoming distinguished alumni Simon Chu and Stephen S. S. Wong. We hope to see you there. For more information, please contact the US Commercial Service Shanghai or Beijing Offices. Our partners at ULI will be hosting their annual meeting on December 6th, 2018. This year, they will welcome speakers Albert Chan, Professor Shiling Zheng, and more, to discuss the future of real estate in China. We look forward to seeing you there! Join us November first for an enlightening talk by Mark Sarkisian on new challenges facing architects and structural engineers, as well as his own career of developing innovative solutions. Andy To, Managing Director of the United States Green Building Council (USGBC) for North Asia will introduce how USGBC supports architects during the design and construction Green Buildings in China. USGBC runs the LEED system of building ratings and professional certifications, one of the most popular international standards for Green Building. IFMA (International Facilities Management Association) will holder their World Workplace China & FM Conference 2018 in Beijing. The theme of 2018 is an era of FM-Technology motivates innovation. The annual IALD Greater China International Forum always focuses on the latest global trend of lighting design, and attracts Chinese and other countries’ excellent lighting designers. 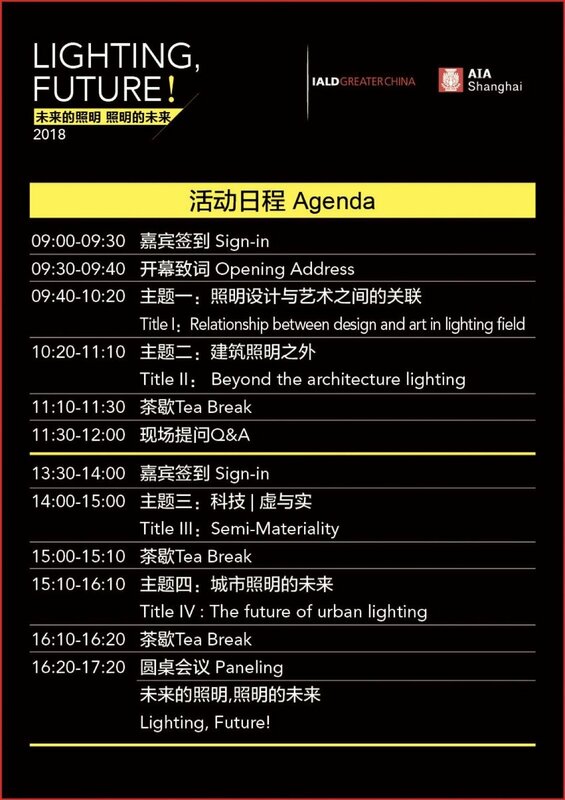 This forum will remain the AIA certifying qualification of academic courses.The forum was strongly supported by AIA Shanghai.AIA's registered architects can participate in domestic forums to accumulate credits, spreading the charm of lighting design and helping the industry co-construction.The “1+N” academic program, play a leading role in lighting design around the world, and pay close attention to the future of lighting. It aims to help Chinese young designers and outstanding lighting design majors from colleges and universities by offering superior resources. For the first time, “IALD Night” will happen, and the IALD members, outstanding students and sponsors will be recognized. We will hold BEED leaning space designer and developer summit, over 300 attendees will attend. Including famous private schools, international schools, education and investment groups, and famous designers. We welcome you to join our Technology and Real Estate Seminar on BIM application at W Shanghai - The Bund on June 27. We will have professionals from Engie China, Gensler, RFR Group, HKS, iDRC and XKool Tech to talk about the BIM application in different fields and the future of technology in real estate industry. AIA Shanghai is proud to partner with Pureliving to provide an interactive session on staying on top of ever changing indoor air quality regulations. Featuring experts from both government and industry. Scan the QR Code for more information. ShanghaiBIM will be hosting an event about the new features on Rhino new version which was released last month. The technical engineer from Rhino's Factory will give a speech focusing on the new functions of Rhino 6.0. From March 16th - 25th, DesignRepublic will be hosting their annual Festival of Design, comprising of talks from Architects, Industrial Designers, Photographers, and more. The festival begins with the opening party at DesignRepublic's offices at 88 Yuqing Lu, Xuhui, 6:30 PM. We hope to see you there. AIA Shanghai in partnership with ULI Mainland China will hold a talk by Daan Roggeveen about Urbanization in China. The Shanghai government has invited AIA Shanghai Chapter President Christopher Chan to speak at a round table on creative urban development in China. Join the annual Winter Meeting of the Urban Land Institute (“ULI”) China Mainland in Shanghai on December 13th and 14th. The theme of this year’s meeting is “Regeneration of Buildings and City Blocks”. The meeting will focus on two types of regeneration. A casual evening networking event for designers. Whether you are in architecture, construction, an IT practitioner, or a student, don't miss ShanghaiBIM's second annual hackathon, November 2017 24 - 26 in the Shanghai Taicang Innovation Space. Failing IAQ tests post construction? Staff complaining of the smell and not wanting to return to work after a renovation? We've heard a lot of these before. Learn from experienced professionals and share your own experiences during these learning sessions. Shanghai BIM and AIA Shanghai will present a lecture on Blockchain Technology for the AEC industry. Dr. Iris Belle of Tongji University will lead this presentation. Please see link below for event details. NEXT ARCH-SERIES 2017 is a series of 6 half-day events to showcase cutting-edge ideas, projects and practices that will impact the next generation of architecture and design profession as well as the future of the built environment. AIA Shanghai and Linver Insights are cooperating to offer this educational series. As a warm up for the AEC Hackathon event held on November 24-26, we invite software and intelligent hardware experts in the architecture, construction, and engineering industries to promote their technology.